Winter is here and giving us a full-fledged reminder of what the term “bitter cold” truly means. Along with the cold there has been no shortage of snow and ice to accompany it. For commercial roofing, this means there will be no shortage of snow removal and de-icing needed. Knowing how to properly have snow and ice removed from your flat or low-sloped commercial building will help elongate the life of your roof, and prevent damages from occurring. Let’s take a look at how to properly remove ice and snow from the roof of your business and why it’s imperative to take action as soon as possible. A soft snowfall is hard to beat on a December day. With the wind at a minimum and the snowflakes gently floating to the ground, it’s what every winter romance is made of. Unless you take into account the effects it has on the structure of your roof. While the snowfall may be light, compiled on top of a roof, that changes quite drastically. And though a roof is built to sustain weight, it’s not wise to have snow and ice remain on it for any length of time, if possible. Don’t be fooled, even a seemingly light snowfall can mean detrimental weight to your commercial roof. Sure, a roof can withstand a decent amount of weight; though that doesn’t mean it should. Though most roofs have an ability to hold about 20 lbs./square foot, you will have to take into account the form of weight is in. If the weight is in ice form, one inch will equal about 5 lbs./square foot, and if it’s in snow form it could theoretically hold up to 4 feet. However, this is largely dependent on how wet/dense the snowfall is. Some commercial roofs should only hold around 3 feet of snow, and regardless which roof is yours, it should not be subjected to that weight for long. As snow melts it will start to build up an icy layer, only to be snowed on again to compile weight. We are well aware snow doesn’t fall evenly. Factoring wind and snow storms, it’s seldom the case that you end up with an exact 3-4 ft. of snowfall on your rooftop. Taking into account the drifting that often occurs, snow will accumulate on specific areas of a roof more so than others. This will result in a higher stress factor on different areas of the roof. Additionally, each roof is different in its overall construction. If your roof is completely flat, snow will not be able to slide off as it melts or shifts with wind. So how do you ensure your roof has the integrity necessary to withstand snow and ice, and how do you effectively, and safely, remove it? Let’s take a look at what preemptive measures can be taken to avoid potential disaster, as well as look into removal methods necessary for commercial and low-slope roofs. One of the best ways to ensure your roof has a safe, supported structure, is by staying up to date with your yearly inspections. During this time, inspectors can identify any weak areas in the roof structure or areas that pose a potential threat for faulty support. Having your roof inspected twice a year, and after major storms, will not only help prevent potential damages, but it will also elongate the life of your roof. If you have an older roof, you may be used to hearing the “cracking” noises that tend to fill the silent drone of a work day. While it may just be the structure shifting, keep your ears aware of potential cracking due to excessive weight from ice and snow. If you’re noticing windows and doors are not opening properly either, this could indicate there is danger in the roof collapsing. To abstain from ever putting your roof under too much pressure, try to have snow removed after it reaches one foot. Plus much more. Each of these requires careful attention and awareness prior to and during snow removal. 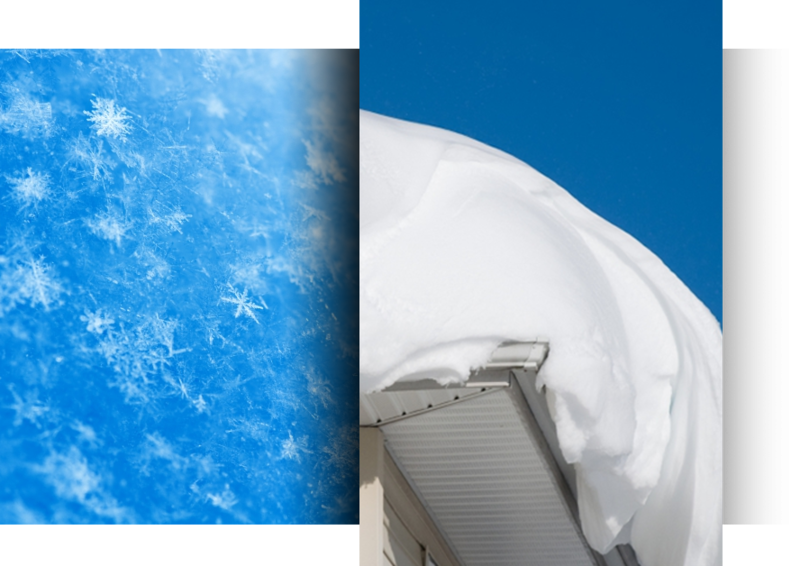 To remove snow from the roof safely, use plastic equipment versus metal to protect roofing material. Rather than eradicating all traces of snow when you’re removing it, leave a slight layer to protect the roofing membrane or any exposed equipment or wires. Start around any equipment on the roof, followed by any uneven terrain or structure changes in the roof. Once you’ve finished removing snow from all of these areas, move to the center of the roof structure. From the center, move the snow to the outer edges of the roof, relieving pressure from building up. Just as serious, and potentially more detrimental to your roof, is the ice that accumulates on your rooftop. 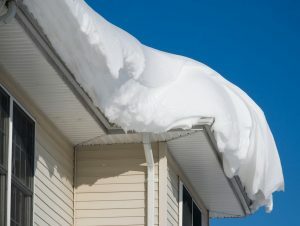 Notably with low-slope roofs, ice dams can accumulate on the bottom of your roof due to the warm air beneath the roof melts the snow, causing it to run down to the bottom of your roof. Once it reaches the bottom, the water will freeze up again where the temperature coming from beneath the roof is cooler. These dams pose a serious issue with the weight your roofing will bare as well as issues with your gutter system. Because ice is often mixed with snow on your roof, you will need to remove snow first in order to effectively remove any ice build-up. To help prevent the issues of ice dams, ensure you have correct insulation and ventilation to keep the temperatures from being so drastically different. Having proper insulation will also be more energy effective for the building, keeping the warm inside and maintaining the proper cool temperature for the roof. And more. If you have a particularly difficult roof to remove snow and ice from, there are companies who specialize in it and are able to help you. As always, after any storm, have your trusted roofing company come to inspect any possible damages. 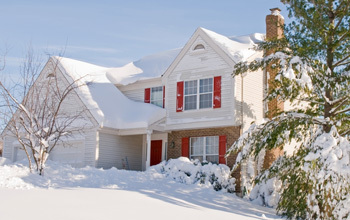 At S & S Roofing Inc., we specialize in setting you up for a safe winter. Our team is experienced and will help identify potential threat areas that may need to be flagged or looked into. We’ve worked on countless styles of commercial buildings which include warehouses, churches, schools, retail, grocery stores, just to name a few. With over 25 years of experience in roof installation, roof repair, and roof inspection, you can trust you’re in good hands. Don’t let this winter leave it’s mark on your roof, call S & S Roofing Inc. and let us make sure you’re covered.